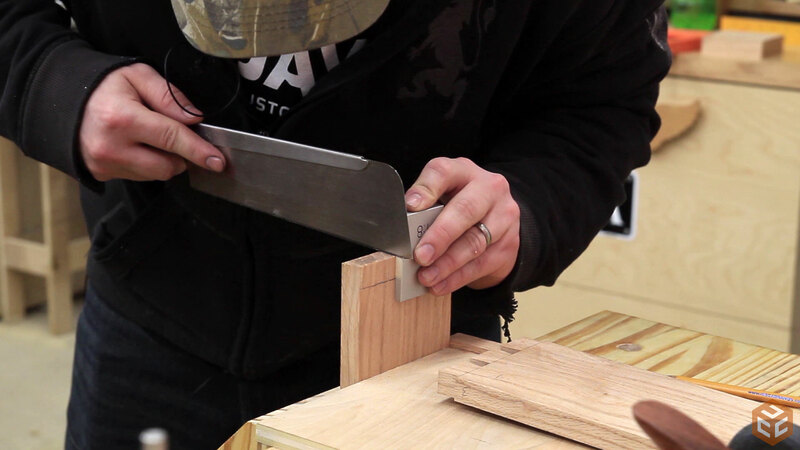 A couple of years ago I vividly recall saying “I’ll never get into hand cut dovetails….ever. I simply don’t have the patience for it.” I also recall growing up not liking green beans. Now I love green beans. 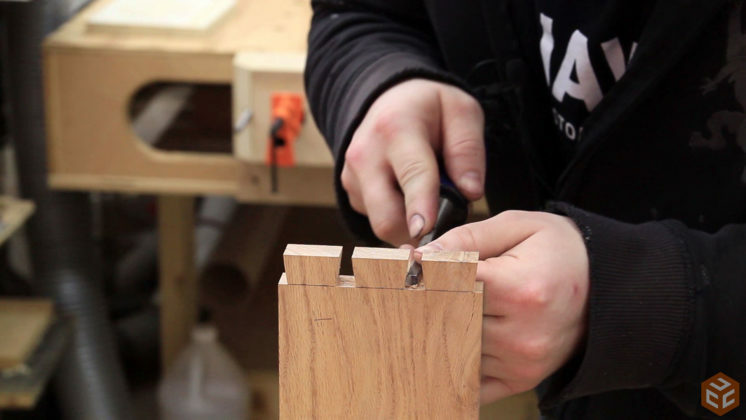 Time has passed and now I’m really enjoying the challenge of hand cut joinery. 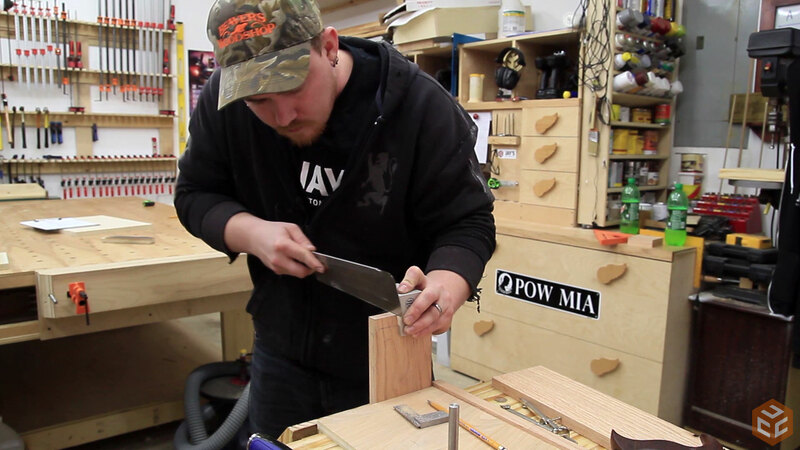 I spend a lot of time on the computer writing articles, editing videos, watching videos, and staying engaged with the online woodworking community so since making my woodworking workbench I’ve been using hand cut dovetails as a way to take a break from the computer and shift my focus. Just like anything else you want to be good at (sports, playing instruments, day job) practice is necessary. I’ve started doing “daily dovetails” and posting them on Instagram. By the way, follow me on Instagram for quick updates between projects. As the “daily dovetails” name suggests, I’ve been cutting at least one dovetail joint per day for a few weeks now. Because of this practice I’m confident enough to incorporate some hand cut dovetails into a project. I had already planned on making a trip a couple of hours south to a friend’s shop and since getting into making dovetails I wanted to bring my hand tools and cut a few joints while down there. Bingo!! 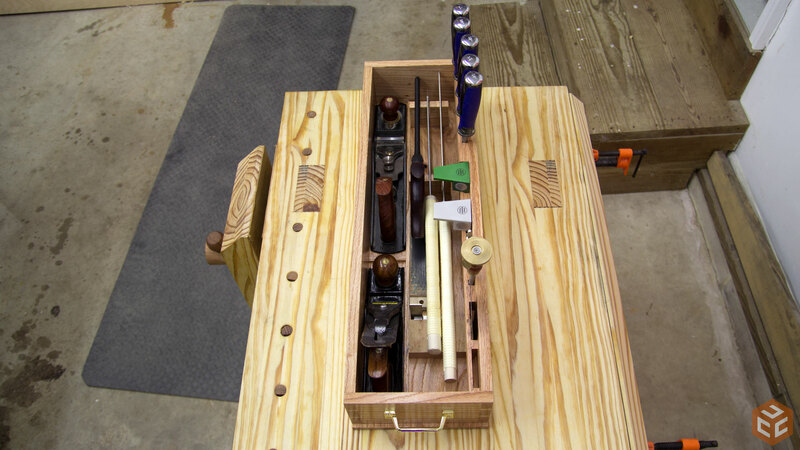 A hand tool tote would be a perfect project to safely bring all of my hand tools along for the ride. The first step was to determine what tools I wanted to bring and what size tote was necessary to accommodate those tools. To get a better visualization I used the corner of my assembly table along with two squares to properly size the tote. I chose to make the tote out of red oak. The oak I was using ended up cupping pretty bad while acclimating to my shop and it had a few knots here and there. As with almost all projects I make, the first step was to rough cut the pieces at my miter saw station. 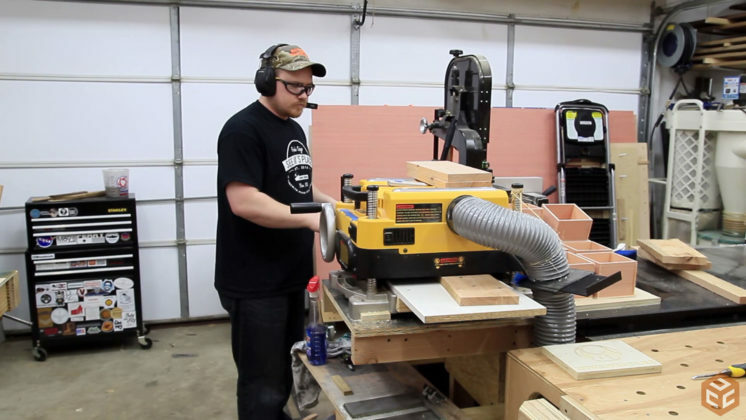 Before using the jointer I finished rough cutting the pieces out on the bandsaw. Then it was much easier to flat one face of each piece on the jointer. Followed by planing to rough thickness at the planer. Up to this point I’ve said rough thickness and size because they are not at their final sizes yet. I wanted to let the pieces rest overnight so that any internal stresses that wanted to release after the first milling process could happen. 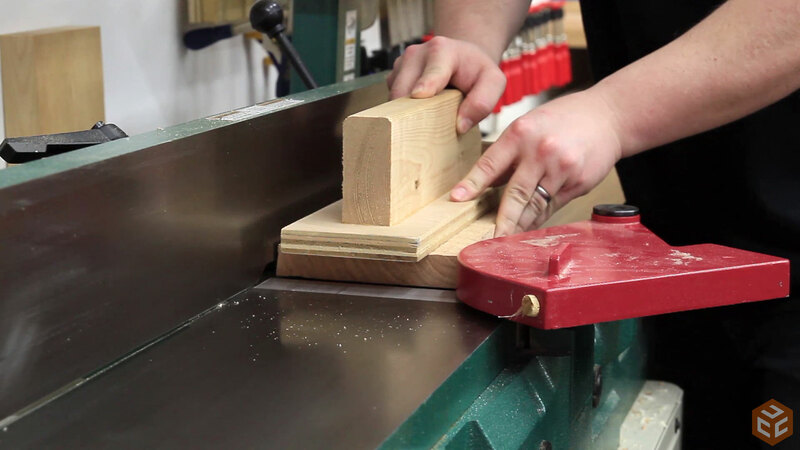 Breaking the milling process down into two stages is a good way to get more stable lumber in the long run. After letting the boards rest overnight I went through the milling process once more to get the material to the final thickness and size. 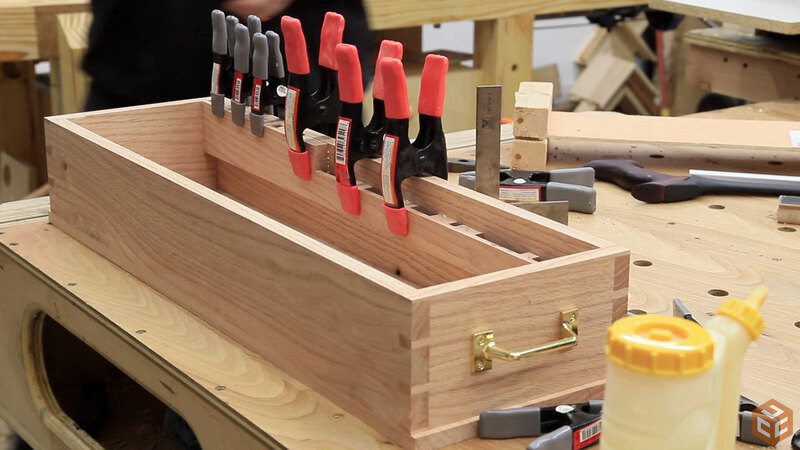 The overall dimensions of the tote minus the bottom are 26-1/4” long, 8” wide, 4” tall, and the pieces are 5/8” thick. 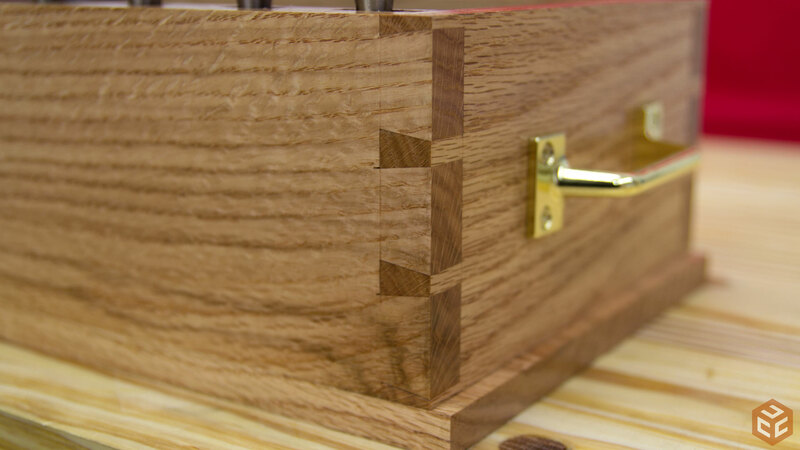 As previously stated, the joinery is going to be dovetails. 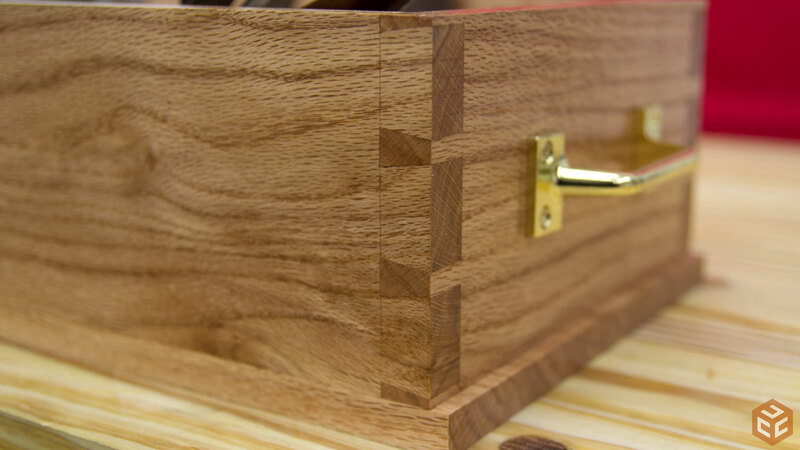 Through dovetails to be exact. 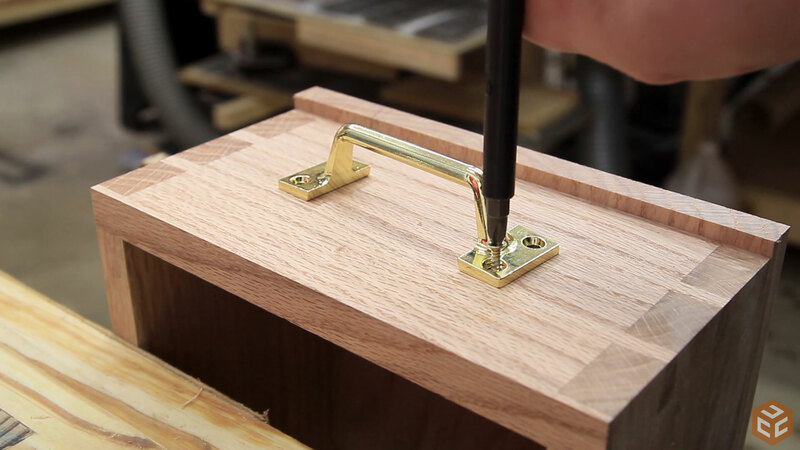 First up is to us a marking gauge to transfer the thickness of the material to the joints. The pin boards need a mark only on the wide faces and the tail boards need marks on the wide faces as well as the short faces. I used a set of dividers to get evenly sized tails and pins. The process is very easy but it’s much easier to explain in video that in text. So watch the video if you are interested in the process. Once the dividers are set it’s very quick and easy to mark out the rest of your joints on the other boards. It’s also handy to have a second set of dividers to mark the half pins first. I don’t have a second set yet so I just measured in about 1/8” before using the dividers. 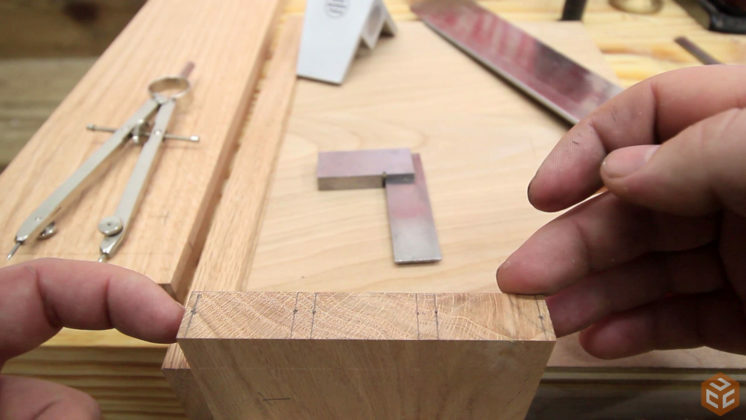 I’m using a magnetic dovetail guide to make the actual geometry of cutting the dovetails fool-proof. This is a magnetic guide from David Barron Tools . This is not a sponsored article or video in any way but I highly recommend you check out this little tool if you are interested in making hand cut dovetails. 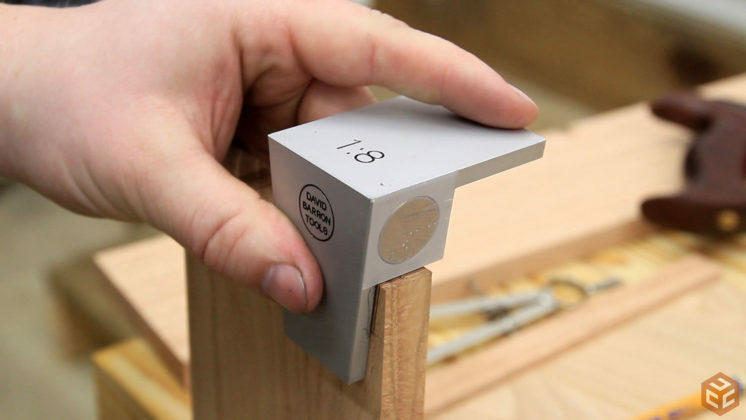 This magnetic guide will guide the saw at the appropriate angle every time. I’m right-handed so I really only want to use the right side of the guide. This means I have to make half of the cuts then rotate the board and the guide 180 degrees to make the other half of the tail cuts with the right hand cut as well. You can chisel the waste if you want. I chose to use a cheap coping saw to hog out the majority of the waste making sure not to cut into my tails or to cut below the marking gauge line. 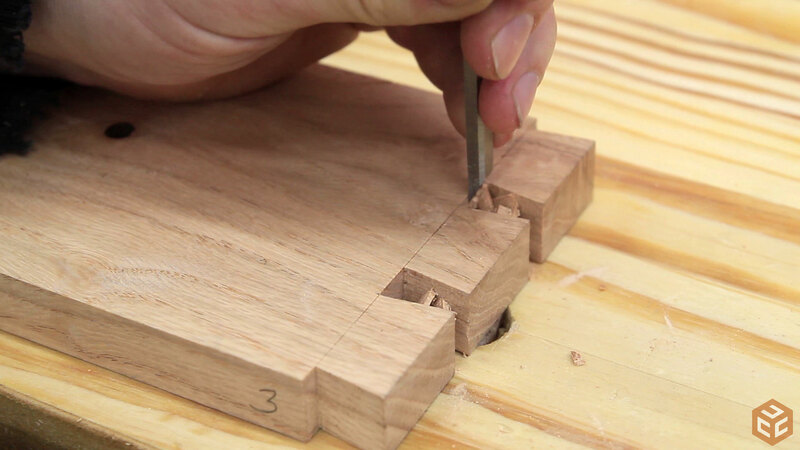 The half pins are easily removed by rotating the board 90 degrees and using the dovetail saw. If you saw close enough to your line you won’t have to use a chisel to clean up later. Next the rest of the waste material needs to be removed referencing the chisel into your original marking gauge line. Only chisel down half way at a time then flip the board and repeat the process from the other side. Finally, you can clean up the interior corners of the pin sockets with a chisel. Again, only cut half way through at a time. Then flip the board over and repeat from the other side. This will eliminate any tear out that may occur from going too far with the chisel. There’s a couple of ways to transfer the tails to the pin board. 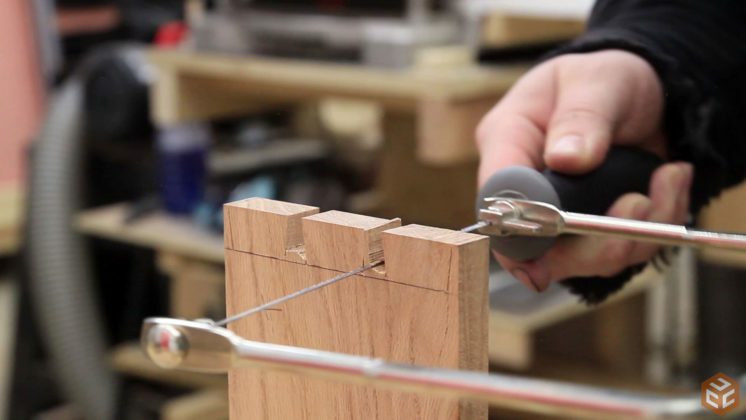 The most common practice is to set the pin board in the vise at the same height as the width of a hand plane. 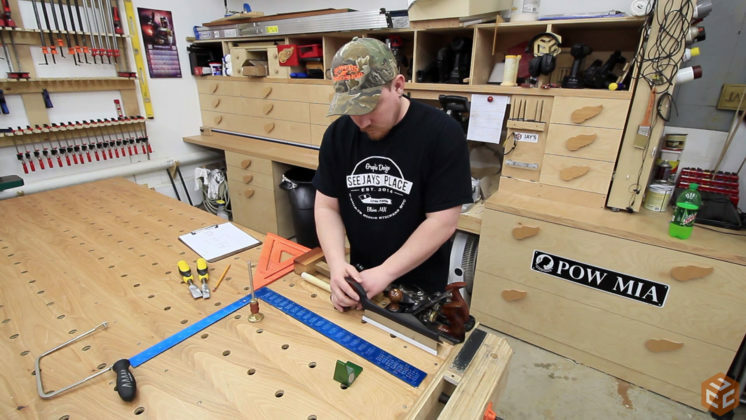 Then move the hand plane away from the pin board and use the pin board and the plane on its side to support the tail board. Align the tails appropriately and mark the pins. 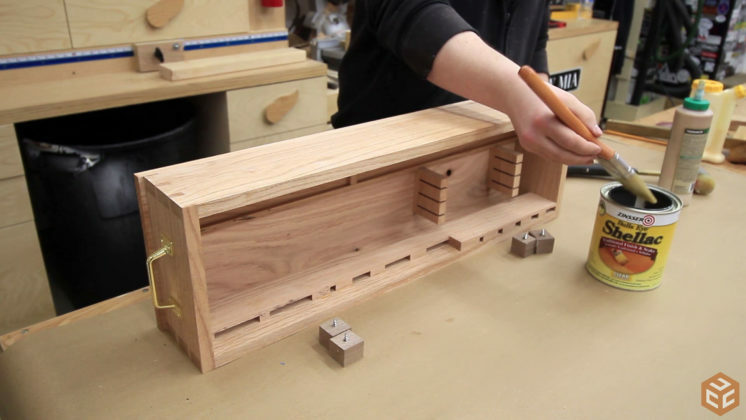 This process is much easier with the help of a simple jig. 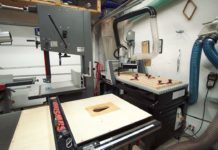 I’m using two pieces of plywood connected at a 90 degree angle with two stop blocks on the left side in both the vertical and horizontal orientation. 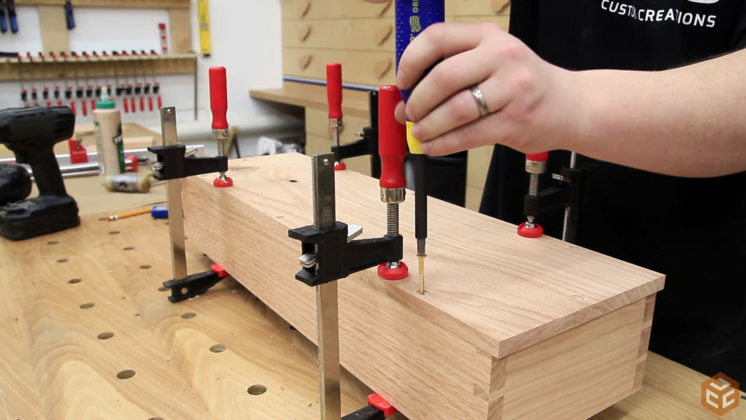 This allows the pin board to be placed on the vertical stop so it is vertical and the tail board to be placed against the horizontal stop so it remains horizontal and perfectly perpendicular to the pin board. Then marking it out is quick and easy. Cutting the pins is just as easy as the tails. But this time the magnetic guide is rotated so that the angled cut will be in the front to back direction and the saw will be traveling vertical. This is also the most critical part of the joint. The entire blade of the saw needs to fall into the waste side of the marking knife line and only the face of the blade should touch the edge of the knife line. The cutting process is the same for the pins as it is the tails. As with the tails, I used a coping saw to remove the bulk of the material. A test fit confirms that the geometry is correct. I can make really nice looking joints freehand with a western style dovetail saw but I can’t do it consistently yet. That’s why I went with the guides and pull saw method for this project. It’s just crazy how much chance for error is removed with a guide like this. 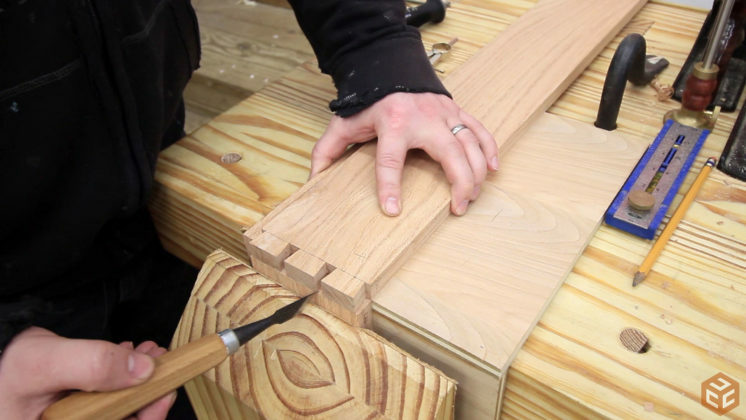 You still have to position the saw yourself and cut on the appropriate side of the marking knife lines so it’s not 100% fool-proof but it’s close. After the test fit the rest of the joint can be cleaned up to the line with a chisel. I normally smear sawdust on top of the glued up joints to mask any imperfections in the joints but I chose not to on this project. I wanted to see how well the joints actually turned out. 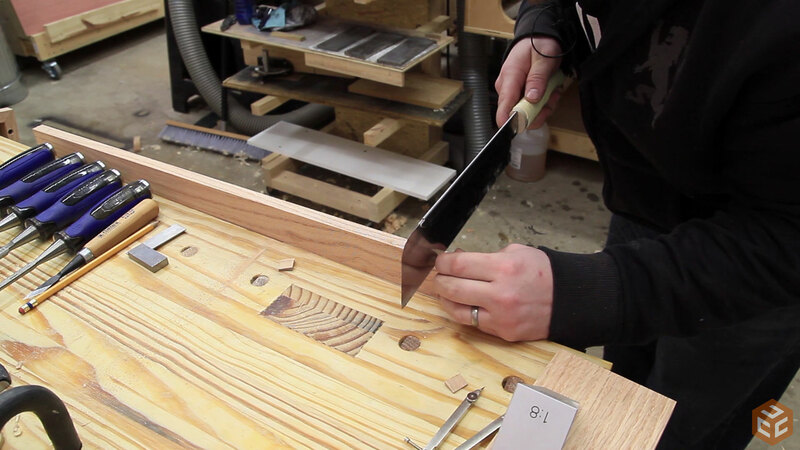 After the glue had dried the joints can be gently smoothed with a hand plane. 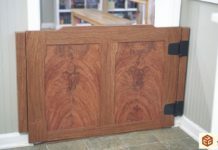 For the bottom panel I used another piece of red oak. This time 1/2” thick, flush on the long sides, and 1/4” long on each of the short sides. I secured it with some brass screws in over-sized holes to allow for expansion and contraction. The single screws in the short sides were in tight holes. The long sides got the over-sized holes. I asked my instagram followers if I should use brass handles or rope handles. They chose brass so that’s the route I went with. I’m glad I did too. I made a vertical tool storage rack for chisels, the guides, and some other tools. This was just more oak at 1/4” thick and spaced according to the tools I had in mind. I also made sure to make the wood grain the same direction as the grain in the side panels. This way it would expand and contract at the same rate as the side. To keep the planes from wandering around I glued a 1/4” x 1/4” strip along the bottom of the tote and one small strip in between the planes to stop them from sliding into each other. 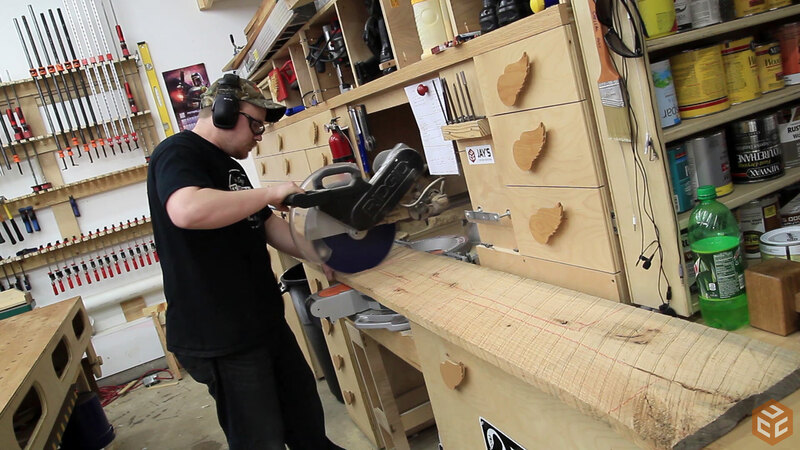 I also cut three notches into two blocks on the table saw to hold the hand saws. These were just glued down to the bottom. The wood grain is in opposing directions here so hopefully it won’t be an issue. I doubt it will be. For a clear finish I used pre-mixed shellac. It’s quick and easy and really hard to screw up. I LOVE the fact that this stuff dries in 10-15 minutes and is ready for another coat. 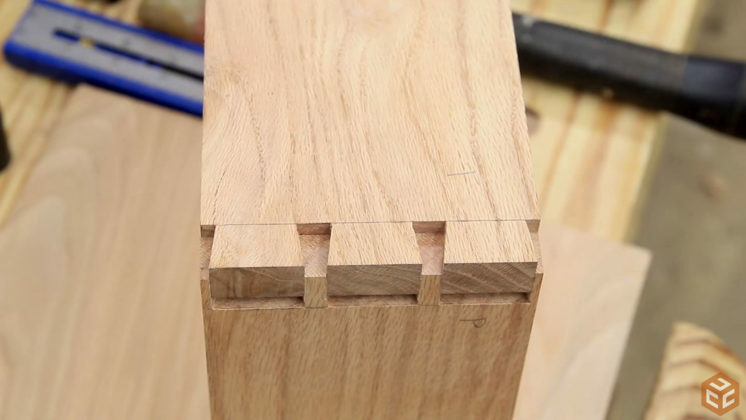 Are these dovetails perfect? No, they aren’t perfect. Two are pretty darn close to perfect and two have spots where I went too far with the saw. But really, they aren’t bad and I’m very pleased with them. You have to get pretty close to see the errors. 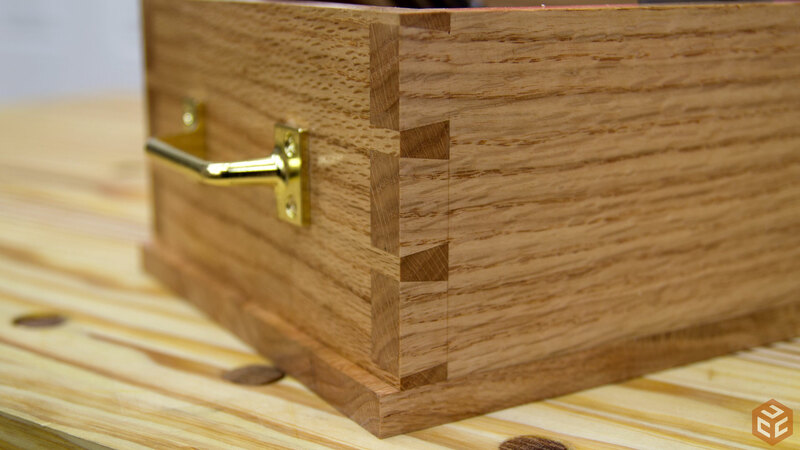 There is plenty of room for continuous improvement and I look forward to the challenge of incorporating more dovetails in future projects. Thanks Tony. No plans for this one. I mentioned the dimensions in the video and the interior stuff is based upon what you want to use. Nice job Jay! That looks great and sure will be handy. I’m where you were a couple of years ago though – I just don’t see my self hand cutting any dovetails. Guess we’ll see what happens in a couple of more years. That’s a very fine job you did Jay ! Keep on pushing. Thank you Edison. I appreciate it. Nice job Jay. 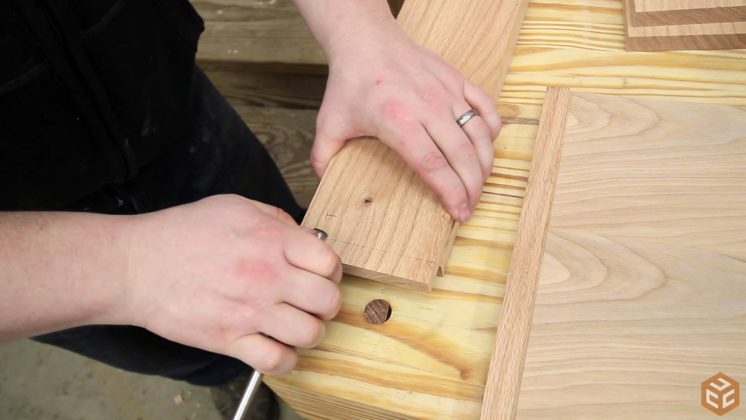 I’m glad to see you use some hand tools on this project. 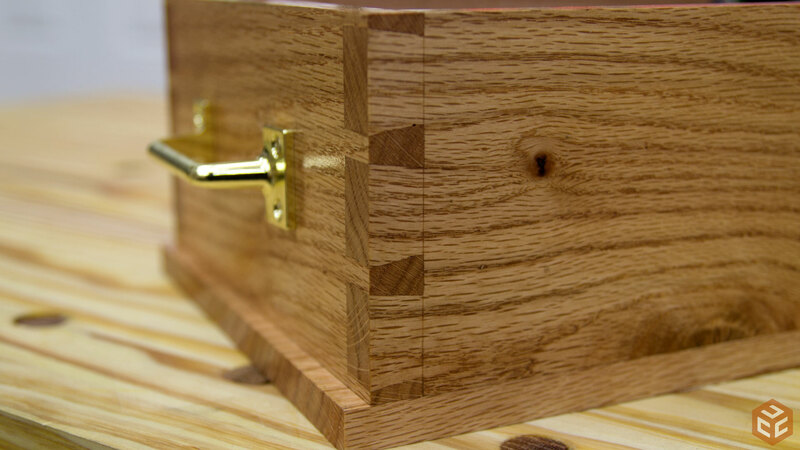 The dovetails turned out really nice. 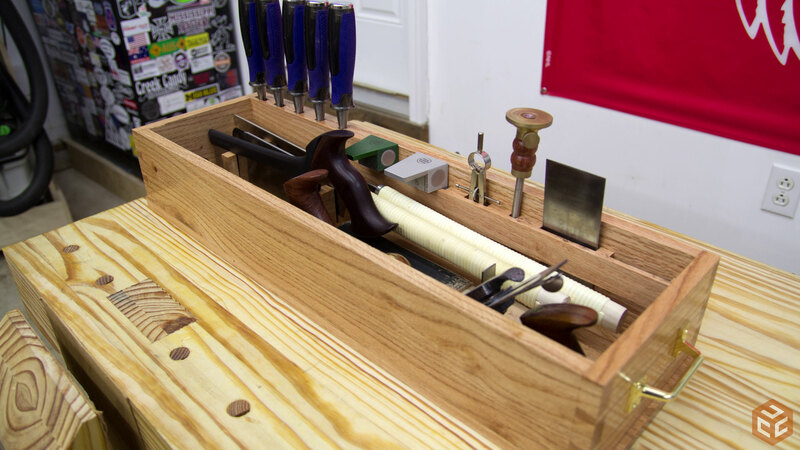 The first project I ever made woodworking was a toolbox 36 years ago out of some old cedar boards I had. I still use it. I have been offered over a $100.00 for it a couple of times. But I just can’t bring myself to selling it. It has 36 years of scratches, and nicks, and patina that I just can’t get with a new tote. Plus I built it with only hand tools that I had at the time. Saw, Plane, and a hammer. Oh wow. I bet it looks great :) Old tool boxes are awesome. Very cool Peter. You should give it a go. The challenge is a lot of fun. Thank you very, very much. You have given me the confidence to try my hand (or hands) on dovetail joints. Just a few more tools and I am off to the races. Again thanks for the encouragement in expanding my skills. WELL DONE! Great job Jay. 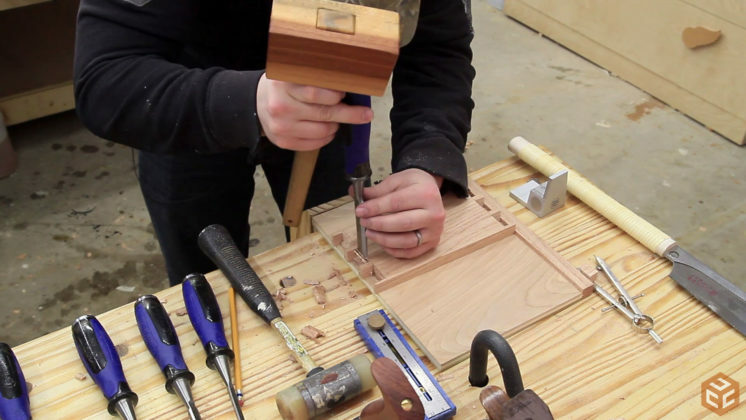 Glad to hear you change your mind on hand joinery. Welcome to the club, and best wishes on your journey. The tote looks awesome! I have no doubt it will serve you well for many years. Very nice work, must of taken a while to do the sketchup (planning where to the place tools). This project was actually done without SketchUp at all. That’s a rarity for me. and in this video you used a similar Japanese style pull saw exclusively (though I’m assuming not the same exact one obviously). Any good suggestions on ones to buy, models, name brands, etc. 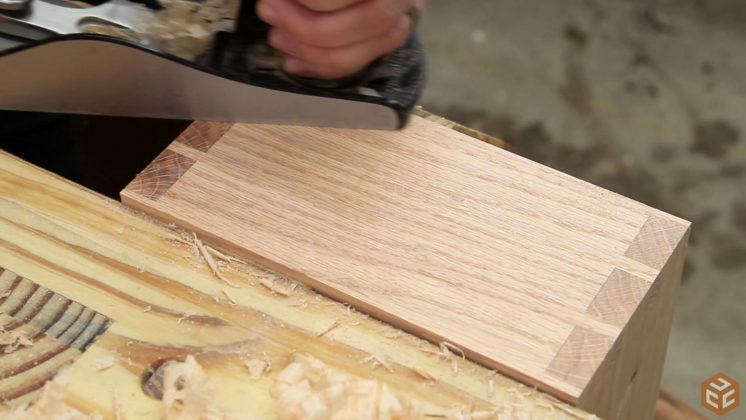 I’m going to be in need for a few Japanese style pull saws very soon (flush cutting and small kerf cutting) and it be good to know what you use and suggest. I ordered the Japanese saw that David Barron recommends for use with the guides. It had not arrived when I made the video so I used the pull saw with the missing teeth. It did the job obviously but still can’t recommend it due to the low quality of the blade. The newer one that David recommends is a lot better. Jay Great job , I learned alot . 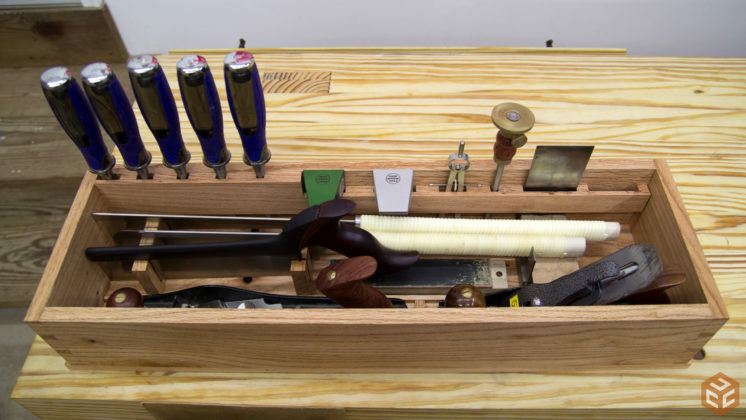 I would add only one thing , Where the chisels touch the botom of the case I would put a piece of rubber to cushion and keep sharp the chisels. If you need some really good and very dense rubber send me the dims. Best DT video ever! And I’ve seen them all. That jig for lining up the tail board is brilliant. Great job! I too learnt a lot. Very nicely made and finished job. The position of your left hand when operating the planer/jointer.. your fingers should be no where near the edge of that boardthose fingers are close to that blade. More fingers get shortened on this machine than a lot of others in the shop..
Jay those dove tails look every bit as good as those on century made joinery by one of the old masters. The only thing wrong with that Tool Tote is that you have it and not me. God Bless my friend. 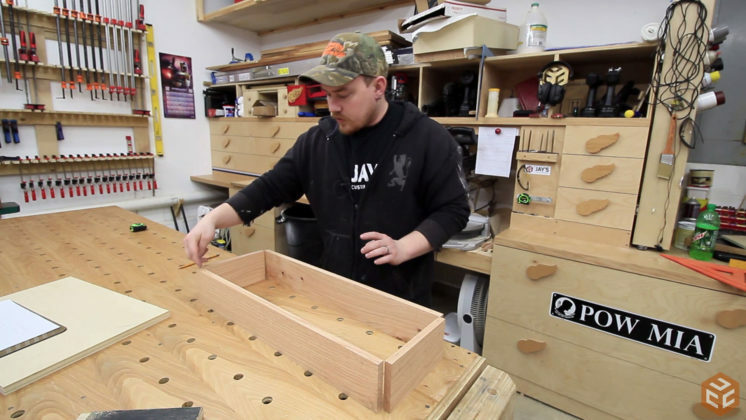 Jay, fabulous video – great job on the tote. I think I may “borrow” your idea and make a couple for my kids for Christmas next. I’ll let them get the tools. Very nice, Jay. 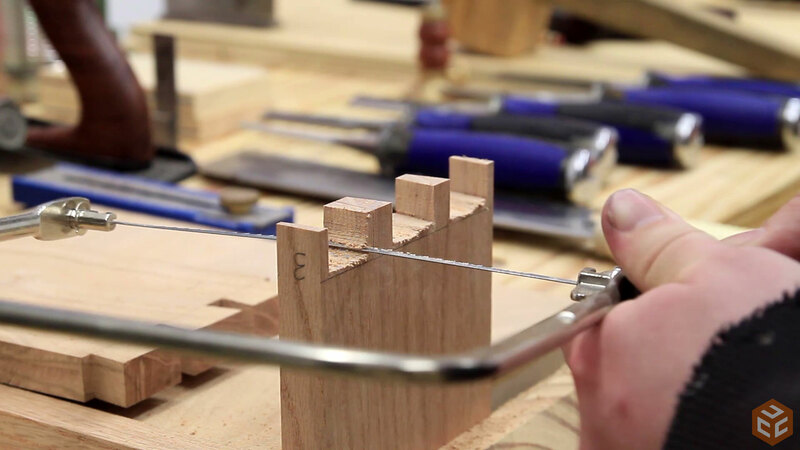 You’re a “real woodworker” now, making dovetails and all. 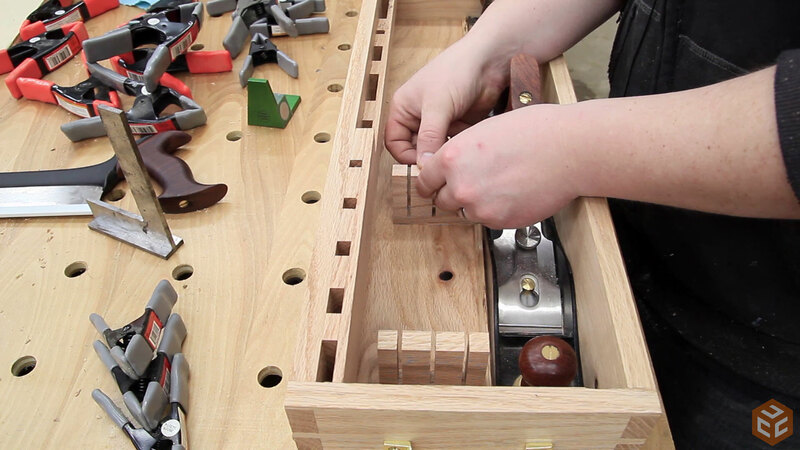 The tool organizers were a good idea, too – everything in its place. The little detail of the slighter longer bottom was a nice touch. i’m new to woodworking and I love your channel and learn so much from you. but am I missing something. 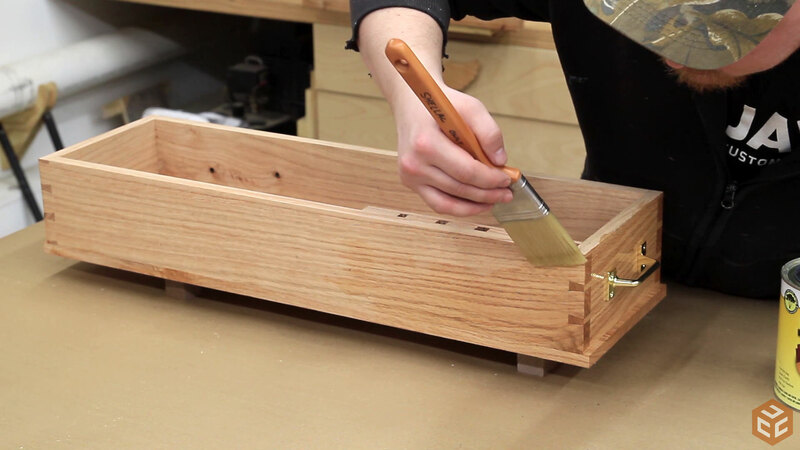 you made a tote that looks like a drawer for the hand tool and the handle on the front, but nothing to cover it. how are the tools going to stay in when you carry it.?????????????????? There is a handle on each side. You pick it up. The tools stay in place with gravity when you carry it. I don’t plan on twisting it upside down. 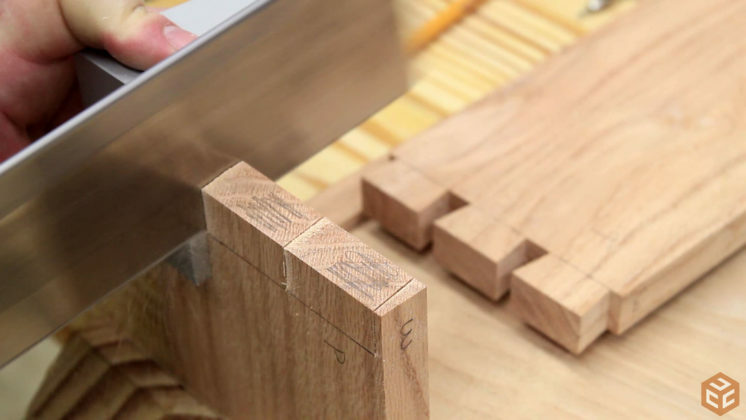 You’ve gotten very good at hand cut dovetails in a short period of time. It took me much longer to get that good. Wow, that looks great. Keep up the great work, I really enjoy your projects. 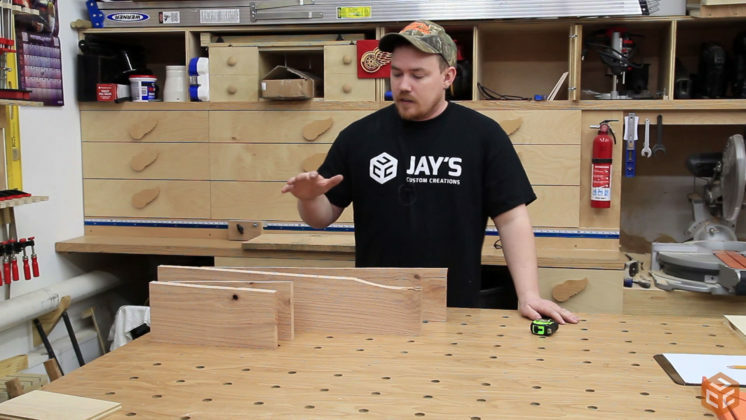 First rate craftsmanship, Jay. Very impressive work. 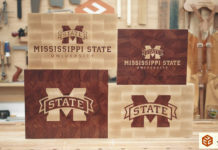 Nice to see that a project can be done start to finish using no power tools. I like the methods that you used to mark out the tails and pins, and the way you coped out the gross debris. Very good descriptions and useful terminology so that a novice like myself can get professional results like you’ve gotten. I look forward to your newsletter and I always learn something from you. You’re an excellent teacher and your skills are appreciated.